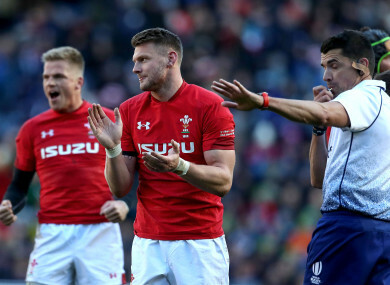 Gareth Anscombe and Dan Biggar celebrate at the full-time whistle. WARREN GATLAND ACKNOWLEDGED fortune was on Wales’ side as they held off a fierce Scotland fightback to triumph 18-11 at Murrayfield and move to the brink of Grand Slam glory in the Six Nations. Tries from Josh Adams and Jonathan Davies put Gatland’s men in control on Saturday and they were 15-6 up at the interval, despite Gareth Anscombe striking the post with a routine penalty attempt late in the first half. However, a Scotland side hampered by the injury-enforced withdrawals of their entire back three dominated the second period, meaning the visitors were forced to hang on in order to extend their winning run to 13 Tests. Wales can now complete a third Grand Slam under Gatland by beating reigning champions Ireland in Cardiff next weekend. The head coach told the BBC: “We struggled in the second half but I spoke to the guys afterwards and said when you look back and you’ve won a Grand Slam there’s always probably one game you look and go ‘that was a little bit lucky’. That was definitely today. “It was pretty nerve-wracking. They got some penalties and some momentum and put us under a lot of pressure. We’ve got a dream at the moment and we’ll start planning for next week. This group of guys have forgotten how to lose. Winning becomes a habit … and so hopefully that continues next week. Gatland and his players saw their preparations for the Scotland clash blighted by chaotic goings-on in the Welsh domestic game, with talk of a proposed merger between the Scarlets and Ospreys creating significant uncertainty and anger. Asked if the turmoil had been a factor in Wales not being at their best in Edinburgh, Gatland added: “There is no doubt about that. Players on their phones and texting, ringing home and going to meetings and talking to people in their clubs. That undoubtedly has an impact, but I’m proud of them for the way that they got themselves out of that, dug deep and showed some real character. “We need to sort those issues out as quickly as possible but when you look back on a Grand Slam there is always one game you think was close and that was probably today. Email “Fortune on Wales' side as Gatland's men march on towards 'dream'”. Feedback on “Fortune on Wales' side as Gatland's men march on towards 'dream'”.